Weiβ Schwarz Cards of the Day: 22nd of October | TCG, shiyo? 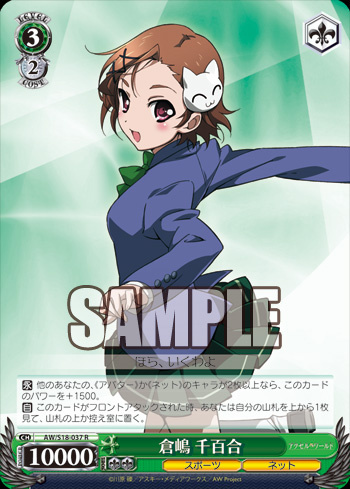 To start off a new week we’ve got a pair of Chiyuri cards to continue to Accel World previews. [CONT] If there are 2 or more other «アバター Avatar» or «ネット Net» characters in your Stage, this card gains Power +1500. [AUTO] When this card is Front Attacked, look at the top 1 card of your Deck and put it to the top of the Deck or the Waiting Room. Up first we have a Chiyuri Level 3, who can get pretty big fairly easily and can help keep you in the game longer. Her first effect should be fairly easy to pull off, since the set is full of «アバター Avatar» or «ネット Net» characters. Since you only need two of them you can probably fulfill this with support cards alone, meaning you usually won’t need to worry about characters being defeated and her losing power on the following turn. A +1500 boost is huge for this small a requirement and can easily make her a threat to other Level 3 cards. I suppose she can be allowed such a large boost since she’s lacking in all the usual effects you expect from a Level 3, such as heal or draw. Her second effect is also very passive, so she can make up for that by being an aggressive attacker. Her second effect is very useful, since it will allow you to increase your chances of cancelling every time she’s attacked. She’ll either leave a Climax on top of the deck, or dump a non Climax and increase the chances of cancelling the attack. [CONT] If this card is in the Front Stage Middle Border, this card gains Power +1000. 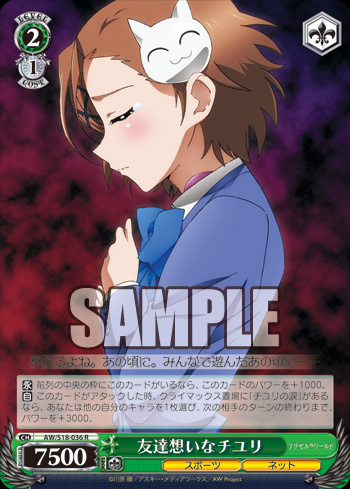 [AUTO] When this card attacks, if [Chiyuri’s Tears] is in the Climax Border, choose 1 of your other characters, and it gains Power +3000 until the end of your opponent’s next turn. Caring for friends, Chiyuri is a straightforward card that will often just act like a 2/1 vanilla, but also has a Climax combo. Normally she sits at 7500, but in the middle of the Stage she’ll reach 8500, the 2/1 vanilla standard. This means that to get the most out of her you’ll want to restrict yourself to only using a single copy most of the time. Even if you never got the Climax combo to work, she’d still be quite useful just as a vanilla. However when you do get the combo you can outclass other plain 8500s. With a 3000 boost, on top of whatever the Climax gives, you should be able to defeat your opponent’s other Level 2 characters, and take on Level 3s without too much issue. It could even give some of your Level 1 cards enough power to take on Level 3s that aren’t supported properly. The fact the boost sticks around for a turn will also mean that you can defend yourself more easily from revenge attacks on the following turn. Turns when you have the Climax combo might be the only times you’ll want to play extra copies of Chiyuri to the Stage. For example with two you could have them boost each other to 11500 and 10500 respectively, which are pretty beefy for a Level 2. Alternatively you could put all the power into a single other character, and wipe out your opponent’s biggest threat.